How long have today’s most popular websites been around? This is a survey of when today’s top 50 websites began their lives. What we here at Pingdom wanted to discover when we made this survey was not just how old the most popular sites are, but to see if we could discover any interesting trends based on that, and we think we did. For the extra curious we’ve also included a table with the individual launch years for all of the top websites at the bottom of the article. A note about site inclusion/exclusion: We based this chart on the Alexa top 50 sites in the US. We should note here that we filtered out a few sites from the top 50 because we considered them sites that people don’t normally visit. Some ad networks (like doubleclick.com) always end up in artificially high positions due to the way Alexa measures, for example. We tried to focus on websites that people actually use. After the filtering, we ended up with 42 sites (the list is available at the bottom of this article). Although the above chart pretty much speaks for itself, especially with the red trend curve, here are a few observations based on the data we collected. 43% of today’s top sites were started in 1996 or earlier. The three “biggest” launch years, from largest to smallest: 1996, 1995, 2005. 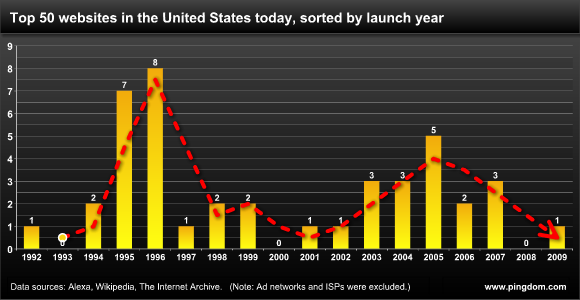 The sites launched in 1995, 1996 and 2005 together account for almost 48% of the top sites. Fun fact: The oldest site in the current top 50 is IMDB.com, which launched on the Web in 1992. The youngest is Bing.com, launched this year. The Web is still young (a teenager in human years), so it’s difficult to draw any long-ranging conclusions from the gathered data, but we can at least make some reasonable assumptions (and pose a few questions) based on it. The peak at 1995-1996 is when the Web really started to take off, so understandably a lot of big properties launched websites back then (including traditional media like the New York Times and CNN). The slump around 2000-2001 is also understandable. That’s when the dot-com bubble burst. Question: Was the time around 2005 an unusually creative and productive (and successful) era on the Web, or is it a matter of the cyclic rise and fall in popularity of websites? Will we in two years’ time see a peak around 2007 instead of 2005 if we perform the same survey, i.e. do most websites “peak” after around four years? What do you think? Please share your thoughts and insights with us in the comments. Very interesting survey! I work in the German online sector and we see the same trend here. A big proportion of very successfull websites launched in the 90s, among these international brands such as amazon, google, ebay, yahoo etc as well as some national ones (immobilienscout (real estate), mobile (cars) etc.). Many of them were pushed into the market with very high marketing spendings which were financed by bullish capital markets. They either used low market barriers with low distribution costs, which made spreading information nearly costless (news, entertainment etc.) or they built virtual market places and therefore replaced som unefficient parts of the old economy value chain (categories, market places). All these business models have in common, that they are base on some kind of a centralized web services, an aggregator of information which is open to everybody. But then we see a couple of websites that arised in the early/mid 2000s. Most of them belong to social networks/communities. They are based on a more decentralized approach, letting users share information within a closed or focussed environment. These plattforms are more or less enablers for communication, they do not aggregate information on central point. Surely, one major reason for the rise of these plattforms are improved technologies such as higher bandwith and dynamic page building. So maybe the second peak is due to technological improvement. What will come next? I think that cloud computing will evolve some great web based applications that are even more complex than todays ones (consider Microsoft Web Office) and place greater demands on computing power. But after all, establishing an online brand is not as easy as it seems. I think, we will not see such a peak as in the 90s anymore. Alas, 50 is not enough to draw any conclusions from, you would need 100-200 at least IMO. To reply to Sebastian’s comment, I have to agree that creating a lasting online brand is extremely difficult. I would look at the emergence of all the linked data sites and social networks as somewhat of a beginning of another era in the web. I think that we may see a peak as we did in the 90s later on, especially since the technology keeps evolving. I guess only time will tell. Very interesting. I am somewhat of a ranking freaking. Checking the Alexa ranking of my website is one of my favorite activities to do. The list contain some of my favorite websites and certainly is in other people’s lists. I appreciated this post. During the 90s, there were fierce competition to showcase creativity and business ideas. Since that date, web surfers has been more selective so therefore I think that is the reason for less newly sites created cracking the top 50 list. Thanks for taking the time to prepare this post. I was looking for major websites by year of introduction. You provide that and more. Perfect! I work for Overstock.com which is turning 11 on October 1st. It’s fun to see who launched during the dot.com boom and survived the bust and then went on to thrive.